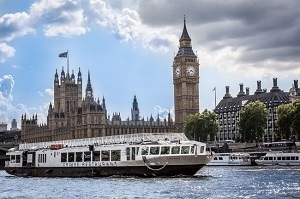 The River Thames has been London's lifeline for centuries so it's no wonder that you want to take a River Thames Cruise and see London and all of its iconic attractions from the water. But which sightseeing cruise should you choose? There's a hop-on-hop-off cruise for travelers looking for a DIY trip on the water, with live commentary this is a great boat trip for first-time visitors to the city. You'll also find food cruises whether you enjoy lunch, dinner or afternoon tea as you cruise up and down the river. Combo tickets that combine a top sightseeing attraction with a sightseeing cruise are good value for money and also perfect for the time conscious traveler who wants to get as much done as possible. With all of this available and more, we can understand how easy it is to become overwhelmed on which Thames River cruise to choose so we've done the hard work for you by looking at all the available options across 4 booking sites, reading the reviews, and checking the prices so that you know you're making a choice from 10 of the best London river cruises. 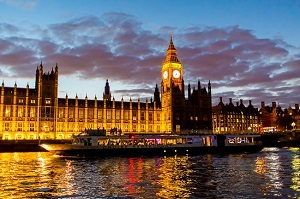 A 3 hour Thames River cruise with dinner, drinks, and entertainment. A four course meal is served whilst you enjoy the live cabaret entertainment. See the city lit up at night as your cruise down the Thames past some of London's top attractions. Cruise past the O2 Arena, Canary Wharf, and more. Enjoy a delicious 4 course dinner on the river. Listen to a singer performing West End songs during dinner with dancing after. 4 course dinner with half-bottle of wine per person. A glass of sparkling wine or champagne on arrival. Tea or coffee after dinner. Receiving fantastic 4 and 5 star reviews visitors say this river cruise is "Very Good". Reviewers say that there was plenty of good food and the atmosphere with the other guests was fantastic. 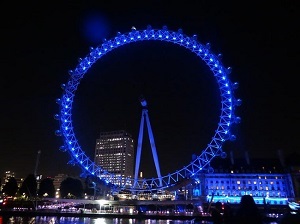 They also say that the entertainment was fantastic and it was lovely to see London lit up at night. Great if you're celebrating a special occasion such as a birthday or anniversary or simply want to live it up in London! Perfect for couples, it's a romantic evening full of glitz and glam. A beautiful and glamorous way to enjoy a night in London. 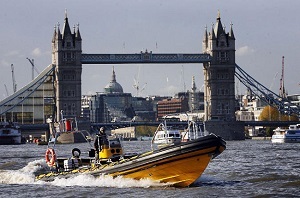 A thrilling 50 minute high speed cruise on the River Thames on an RIB (Rigid Inflatable Boat). With James Bond theme tune music you'll whiz past London's top Canary Wharf attractions. Learn about the sights you're passing with onboard live commentary. Race towards Canary Wharf at a rate of 50 knots on a speed boat. Enjoy the interactive guided tour of London like you've never experienced it before. Feel like you're in a James Bond movie! All weather clothing to keep you warm and dry! 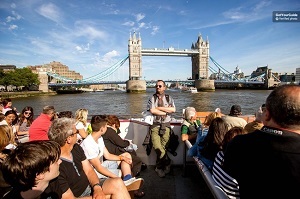 This thrilling boat tour receives top marks and good reviews from visitors to London. Travellers have described this cruise as "Exciting! ", "Brilliant! ", "Thrilling!" They have said it's a "Must Do" and "Top Entertainment". If you're an adventure-seeking dare devil this is a tour made for you! A fun and entertaining way to see London fast whether you're on your own or travelling with the family! Kids must be accompanied by an adult and weight more than 15kg. 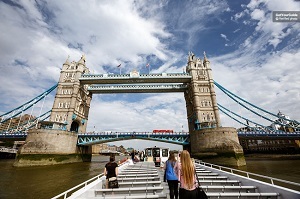 A combination ticket for 1 day hop-on-hop-off sightseeing river cruise plus entry to the Tower of London. Move around the city with ease whilst taking in all of London's most iconic riverside attractions. Then, visit the Tower of London as you view the Crown Jewels and meet the Beefeaters. Enjoy sightseeing on the river cruise. Move around London's top riverside attractions with ease. 1 day pass for the hop-on-hop-off river cruise. Live commentary on the river cruise. This combo ticket is very popular with travellers and has received thousands of top rated reviews. People have said "This is an excellent tour" and "We found the Tower of London a great experience." People agree that the commentary on the cruise is excellent . A great way to sightsee London. A good way to save money on both attractions. A combination ticket for the London Eye and Hop-On-Hop-Off Sightseeing Cruise. 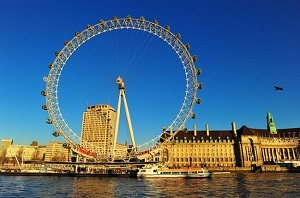 1 day access to ride the London Eye and sightsee the city using the Thames to move around. A memorable way to spend 1 day in London! See how London looks from the river. See how London looks from the sky! The ability to plan your day as you see fit. Sightseeing hop-on-hop-off river cruise ticket. Live commentary onboard the cruise. "A very enjoyable and easy experience"
"The cruise and London Eye are magical"
"Great views and amazing photo opportunities"
Great for solo travellers and families who want to see London and ride the London Eye. Great for people who want to sightsee on their own terms, at their own pace making their own itinerary as they go along. Good for locals too - See your city as the tourists see it, you might even learn some new things! A night of live entertainment on the River Thames with a 5 course dinner. A glam, romantic evening - An unforgettable way to see London. Cruise by the top riverside sights lit up in all their glory. 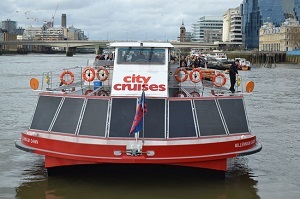 See the sights of London on a 2.5 hour evening cruise. Dine on a delicious 5 course luxury evening meal with free drinks. "A great experience!" "We love loved this dinner cruise!" "Great ambiance and great views" "A brilliant way to see London at night"
Travellers agree that the food is excellent and the evening a success that they highly recommend. A romantic evening on the river Thames aimed at couples. There is a smart/casual dress code so make sure you packed something suitable... or go shopping to buy something! Children aged 12 years or younger are not permitted. A 90 minute lunch time cruise with 2 course meal. Spectacular views of London as you cruise up the River Thames. Information on the sights that you pass with audio commentary. Enjoy a classic 2 course lunch cooked on board. Watch Big Ben, St. Paul's Cathedral, London Bridge and more pass by as you enjoy the view from the outside deck or from your table. Learn all about the history of London and the sights and monuments that you pass with audio commentary. This cruise consistently receives 4.5 and 5 star reviews. Travellers sum up their experience by saying "Lovely lunch with great views and attentive staff"
Everyone agrees that the food served up onboard is delicious. Great for couples and friends looking for a stylish way to pass the afternoon. Perfect for first-time visitors to London but also locals! A 90 minute Thames sightseeing cruise with Afternoon Tea served onboard. Watch London's top riverside attractions pass by whilst you tuck into sandwiches, cakes, and tea. Relaxing piano music is played thanks to an onboard pianist on some vessels, or you can get commentary of the monuments you're passing. Scoff the sandwiches, scones, pastries, and cakes all washed down with lashings of tea! Watch London pass by the window as you cruise down the Thames. Afternoon tea - A selection of sandwiches, scones, pastries, and cakes with tea (or coffee). Live piano music OR audio comment. This cruise gets top marks from most reviewers. They say "Very enjoyable cruise, good view , and the food was very nice"
"We had a very nice boat ride with enough food for lunch or even dinner!" A sophisticated way to relax and enjoy the afternoon whilst enjoying the sights. Great for couples and friends but not so good for families with young children due to the sophisticated atmosphere. Locals as well as travellers enjoy this scenic tasty cruise! A 2 hour sightseeing river Thames cruise at sunset. Admire London's most iconic monuments as the sun goes down in a spectacular show of color. With a glass of sparkling wine in hand, and live music performances there's no better place to admire the sights of London! Cruise down the river Thames as the sun goes down for another day in the city. With a glass of sparkling wine in your hand as you munch on a canapé, enjoy the marvellous city views. Tap your feet to the live entertainment with pop and jazz performances from talented singers. Constantly receiving 4 and 5 star reviews, travellers are thrilled with the sunset cruise. One happy cruiser said "Wonderful cruise with great commentary. Brilliant views of London. Highly recommended." Another said "Overall one of my favorite things I did on my 2 week vacation that took me to 4 different cities. " 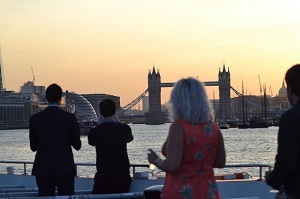 Perfect for couples seeking a fun evening on the Thames with a party atmosphere. Great for travellers but also a fun evening for London locals too. Not suitable for families with younger kids - There's an age restriction with kids younger than 13 not being allowed onboard. A 1 day pass for the hop-on-hop-off Thames River cruise, an entire round trip taking 2.5 hours. 4 piers to join or depart at get you around all the key riverside locations in London. Live commentary onboard that's both fun and informative. Easily move along the River Thames reaching all the key riverside tourist destinations of Westminster (for Big Ben and the Houses of Parliament), Greenwich (for the Cutty Sark), Waterloo (for the London Eye, the Aquarium and more), and Tower (for Tower Bridge and the Tower of London). Choose where you want to get on and off and when as you make your own itinerary around the city. You'll learn the history of London and find out interesting facts about the sights that you pass. 1 day pass for the hop-on-hop-off sightseeing cruise. Toilets and snack shop/bar onboard. This popular sightseeing cruise consistently gets top reviews from travellers and comes highly recommended by those who have already taken it. People describe it by saying " We had a great time and I would recommend it for others" and "We would never miss an opportunity to take the Thames River Cruise! " Everyone agrees that the people providing the live commentary are what make this cruise so special. Perfect if you want to admire the views of London from the water. A good way to move around the top touristic sites. Good for solo travellers as well as families. Get all the best views of London in 1 day! Go on the Emirates Airline Cable Car and a Thames River Sightseeing Cruise. See the city and learn about it too with commentary. Cruise up and down the River Thames on the hop-on-hop-off Thames Clippers River Roamer boat with unlimited 1 day travel. 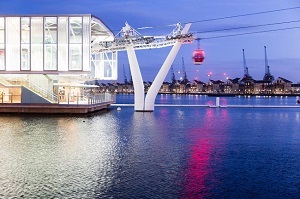 Glide across the river as you enjoy a birds-eye-view look of the Thames on the Emirates Airlines Cable Car ride. See all the iconic sights of London from the water and from the sky. Unlimited 1 day travel on the River Roamer boat. 16 piers to hop-on-hop-off at. This combo ticket is well received by visitors to London receiving mostly 4 and 5 star ratings. People love it because of the views. One traveller said "We had a lovely boat trip along the Thames with the option to hop on and off and a cable car ride at the end"
A great way to see London as you focus on the Thames both above it and on it. A fun day for the entire family. The ability to tailor the day to your own needs with 16 hop-on-hop-off stops so there's plenty of time for extra sightseeing.